Thirteen-year-old Matt Johnson is more than just a singer, songwriter, and teen star – He’s a down-to-earth kid with out-of-this world talent. Matt learned to play violin by ear when he was eight, began performing at festivals at nine, and recorded his first song at ten. His unique combination of charisma, natural athleticism, and musicianship have gathered a serious following and have led Matt to an increasingly lucrative variety of performance opportunities. 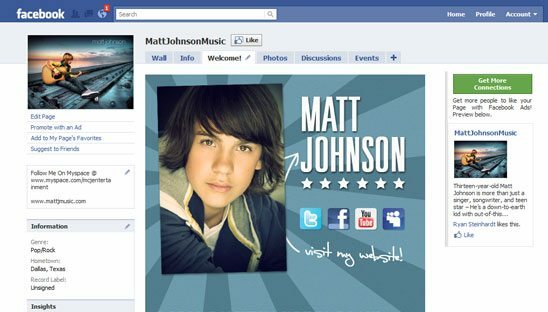 Goal for this Facebook design was to showcase his Disney’s NEXT BIG THING (NBT) link. We also placed in a couple Facebook music players. This is a very simple yet very clean and professional facebook tab design.